Raumfahrt+Astronomie-Blog von CENAP - Blog: Astronomie - Bekommen zukünftige Weltraum-Teleskope Glitter Spiegel ? 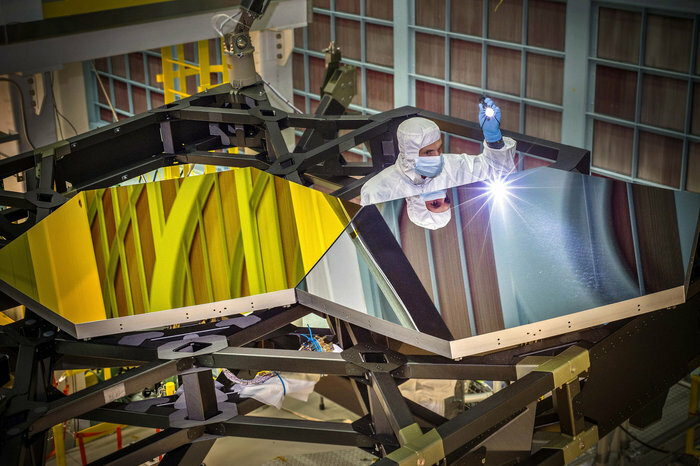 Larkin Carey, an optical engineer with Ball Aerospace, examines two test mirror segments designed for the James Webb Space Telescope. The mirror for the scope is extremely powerful, but heavy and pricey. NASA is building a new space telescope with astounding capabilities. The James Webb Space Telescope, scheduled for launch in 2018, will replace the aging Hubble Space Telescope and will provide unprecedented views of the first galaxies to form in the early universe. It might even offer the first clear glimpse of an Earth-like planet orbiting a distant star. But there's a problem with the James Webb telescope: It's expensive. Very expensive — $8 billion expensive. So NASA has been looking for cheaper alternatives for future telescopes, and Grover Swartzlander, a physicist specializing in optics at the Rochester Institute of Technology, thinks he has one. Astronomers use giant mirrors to capture the light from stars and galaxies, Swartzlander explains, and the bigger the mirror, the finer the detail a telescope can see. But giant mirrors are heavy and expensive. (The Webb's mirror weighs more than 800 pounds, not counting the structure that holds it. The entire spacecraft weighs around 7 tons.) So Swartzlander and his colleagues came up with the idea of making telescope mirrors that weigh practically nothing, because they are made of what is essentially glitter. Yes, that stuff you buy in a crafts store — tiny reflecting particles made of plastic with a metal coating. The idea, he says, is to take the shiny particles into space, spray a cloud of them outside the spacecraft, and then use lasers on the spacecraft to manipulate them into the shape of a mirror. "By controlling all these little glittery objects in space and sweeping laser beams across them we're going to orient them and stabilize them enough so that we can form some kind of an image," says Swartzlander. Now, there is a problem here. Yes, the mirror would be lightweight, but it wouldn't be a mirror with a smooth surface like you get with a glass mirror. So the image that the mirror sends to the telescope's detector will essentially look like a bunch of speckles. "It's going to be a very terrible image," he admits. "But, the real progress on this topic is that there's a new trend in imaging which is called computational photography." By analyzing a series of these speckled images, he says, a computer will be able to construct a good, clean image of the object. Swartzlander says it will take decades to perfect the technology for making glitter mirrors that can fly in space. But that doesn't mean this is just a pie-in-the-sky idea. "We've already demonstrated this glitter concept in the laboratory," he says. The researchers went to their local craft store, bought a jar of glitter and sprinkled it onto a concave surface. Then they used a camera to make an image of what the mirror was pointed at. "One of my smart graduate students worked on some algorithms to actually achieve a perfect image," Swartzlander says. He hopes to send a pint-size version of his glitter mirror into space in the next few years.